Yesterday was the first dry tooling competition of the season. 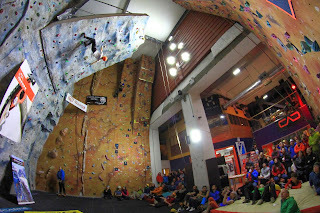 It was a charity event at the Ice Factor in Kinlochleven, organised in support of Climbers Against Cancer (CAC). It was a good competition, helped by the addition of some famous names to the start list. Olympic Ice Climber Andy Turner and the man-machine Greg Boswell both turned up to compete. Kev Shields and the rest of the team at the Ice Factor did a really good job of organizing a very good competition with people of all abilities having a really good day. I only dropped points on one route getting 147/150. This put me in joint first with Greg Boswell, Andy Inglis and Ewan Rodgers. Also getting 147 was Andy Turner but he was competing in the veterans category. I managed to finish all the routes really early and handed my score sheet in first, which technically made me qualify in first. My first place qualification meant that I was last out of isolation for the finals route up the main wall, which was set to its steepest angle. I had a lot of time to sit in isolation and get nervous. I was feeling pretty bad until I sat down and decided to just see this as training. A bit of nervy competition experience will be good for my future climbing. The finals route wasn't too hard so I was a bit annoyed to fall off it, especially seeing as everyone else topped it out. This put me in fifth, with Greg winning, Stevie in second and Ewan in third. Andy managed to cruise to victory in the veterans and Fiona Murray won the womens competition. I had a really good day and despite feeling that I could have done better I do now have something to work on for the next competition! I have attached some pictures of me from the final taken by Gabi Tomescu, Dom Scott and GnBri Photography. I thought I'd look silly popping off the first hold hence the concentration face.